Glen Rock, NJ, (April 24, 2017) – In the past 12 months, more than 10 million people have visited CharityNavigator.org. Most of them are reading Charity Navigator’s ratings and evaluations of charities before making their donations. Many site visitors make their donations directly from the Charity Navigator site by clicking the “Donate To This Charity” button. 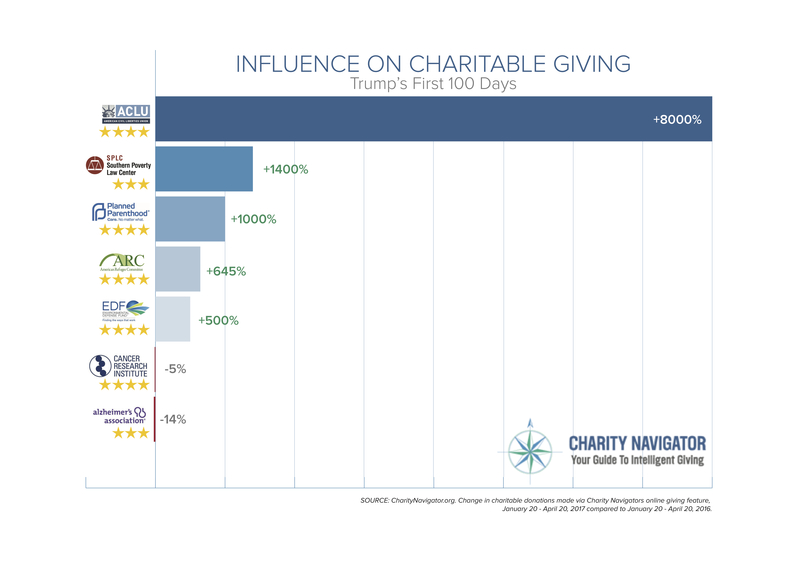 Charity Navigator reviewed the donations made from January 20, 2017 to April 20, 2017 and compared them to the donations made during that period a year earlier. Charity Navigator found that giving on the site was not up across all social action cause categories. Donations to some health and disease organizations were flat or down slightly from a year earlier. Charity Navigator is the largest expert charity evaluator in America. The organization helps guide intelligent giving by evaluating the Financial Health and Accountability & Transparency of nonprofit groups soliciting public support. Charity Navigator does not charge the organizations it evaluates, ensuring unbiased evaluations, nor does it charge the public for this trusted data. As a result, Charity Navigator, a 501 (c) (3) public charity itself, depends on support from individuals, corporations, and foundations that believe it provides a much-needed service to America's charitable givers. Charity Navigator can be reached directly by telephone at (201) 818-1288, or by mail at 139 Harristown Road, Suite 101, Glen Rock, N.J., 07452.